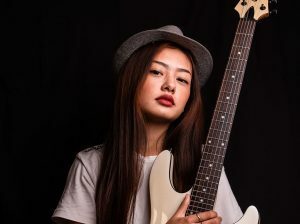 Vecülü Rhakho from Dimapur is a young aspiring musician who sees music as a profession and not just an escape. Her debut ‘The story I know’ is about God’s eternal love for all. Commenting on her first official video, Rhakho said she enjoyed every bit of time that she spent on making it. Also, she learnt that nothing in life comes easy and that one needs to work hard for the best. Rhakho has a positive outlook in life and chose ‘entrepreneurship’ over being a ‘government employee.’ She plans to open a music school one day and provide employment to people. Today, Eastern Mirror interacts to the upcoming young musician sharing her insights. EASTERN MIRROR: An introduction to those who haven’t heard of you yet. Vecülü Rhakho: I’m Vecülü Rhakho, a music enthusiast. I started singing at a very early age. My soul purpose in life is to be a great artist and I will make it happen in this life time. I believe that no dreams are too big if we put our heart and soul to achieving it. EASTERN MIRROR: When did you realise music was the ‘one-thing’ you wanted to stick to for life? Vecülü Rhakho: When I was 17 years old, I decided to take piano class. That was when I took music seriously. I love singing as a kid though i’ve not taken vocal class and I’m going to. I knew I had to involve into music full time and I devoted myself into music and making music. To be honest, I should have realised it sooner, but its never too late and I will continue making my own music in the days to come. And I’m sure God will take care of the rest for me. EASTERN MIRROR: What is your debut “The Story I Know” all about? And how was the first video making experience like? Vecülü Rhakho: “The story I know” is all about God’s eternal love for us. It was fun making the music video and I have enjoyed every bit of it. One thing I have learned while making the music video is that nothing in life comes easy. We need to work harder to get the best in us. EASTERN MIRROR: Your biggest inspiration? Vecülü Rhakho: My parents are my biggest inspiration. They are second to none. EASTERN MIRROR: Top 5 tracks which are a ‘must’ in your playlist. EASTERN MIRROR: Your personal opinion on the present music scenario of Nagaland. Do you think with such flow, musicians can compete with the rest of the world? Vecülü Rhakho: As an artist, I have observed that the music scenario in Nagaland has evolved over the years. Nagas are very talented and our love for music is eternal. Believe me, we are already competing with world. EASTERN MIRROR: Where do you see yourself ten years from now? Vecülü Rhakho: I live for the moment and I take each day as it comes and I always pray to God to teach me one day at a time. Have said that, I would love to see myself settle down and have kids, teaching them music. After all, if we are unable to pass on the knowledge that we have to our younger generation, what’s the meaning of life? EASTERN MIRROR: Do you follow any specific genre? Vecülü Rhakho: I listen all kinds of music but EDM became my favourite genre which I am most confident in. EASTERN MIRROR: An entrepreneur or a government employee? What would you choose and why? Vecülü Rhakho: I always wanted to be an entrepreneur. Someday, I would love to open music school and teach people and employee people. Vecülü Rhakho: “Failure doesn’t mean the game is over, it means try again with experience”. This helps me get through every situation. Even when I’m flying high above this keeps me grounded and even when i’m at the bottom of my life, this helps me get up and give me the strength to move on. Nothing in life is permanent.